This tower, which projects off the walls of the military fort, El Morro, has a bell-shaped roof. 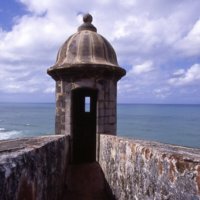 The fort was initially built in the 16th century, to protect San Juan from foreign attacks. It has been enlarged many times across the 17th and 18th centuries. Sentry towers such as this one encircle the fort. 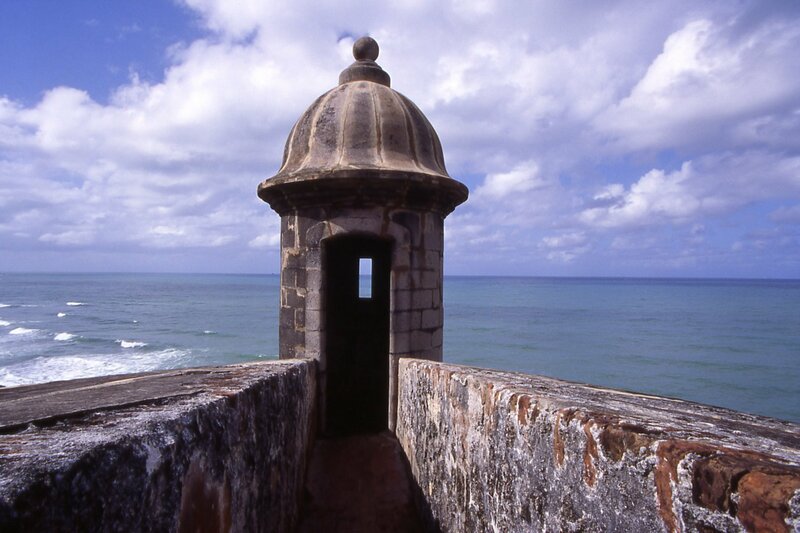 Today the sentry towers of El Morro offer ocean views to tourists, not soldiers. While Carlos V commissioned the fort in the 1539, the structure is dedicated to Felipe II (King of Spain, 1556-1598), his son and successor. The full name of the fort is thus El Castillo de San Felipe del Morro. The fort was built of stone, in places rising over 130 feet above sea level. El Morro is one of several military compounds built to protect Spanish American cities of the Caribbean and Atlantic. Other important forts include those of St. Augustine (Florida, U.S.), Cartegena (Venezuela), Santo Domingo (Dominican Republic), and Havana (Cuba). The fort complex of El Morro provides clear evidence of the close relation between the history and visual culture of Spanish American cities and the oceans.